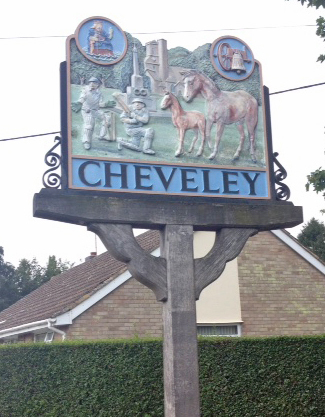 This is a Cheveley village sign micro cache by GCZ Team in a series by Smokeypugs (see below). Please replace exactly as found. The series of caches is based on the ornate signs that depict the heritage, history and culture of the villages that put them up (normally on the village green!). 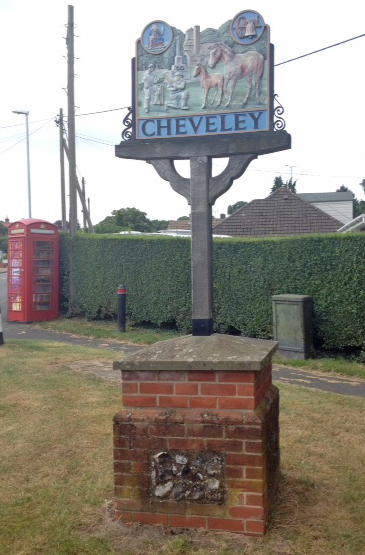 Cheveley village sign is at a busy junction with a small green and a phone box 'library' (one of two phone box book swaps in the village!). The cache is hidden very close to the village sign, which is a beautifully carved and painted wooden sign depicting (among other village scenes) horses, cricketers, the war memorial, the church bell and the church of St Mary and the Holy Host of Heaven (which has its own church micro - GC6CH01).